A rendering of the completed Wabash Lights. 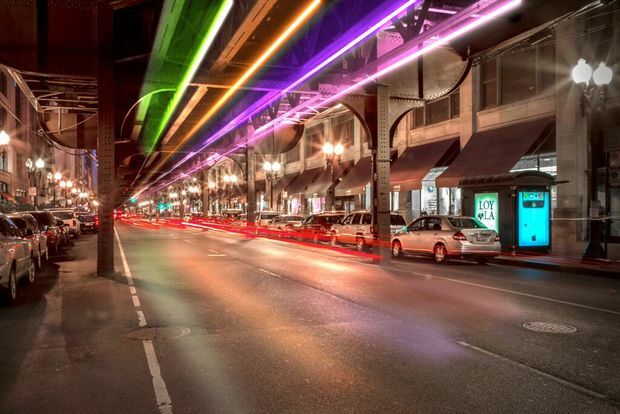 JEWELERS ROW — Two Chicagoans will test out new lights underneath the L tracks on Wabash Avenue after raising nearly $60,000 through a Kickstarter campaign. A small prototype of the colorful "Wabash Lights" project is set to debut in September near the Palmer House Hilton, 17 E. Monroe St., project co-founder Seth Unger said. The plan arrives shortly after the venture surpassed its goal of raising $55,000 through Kickstarter. The Wabash Lights project will use that money to install a Beta version of the lights, a $3 million to $5 million endeavor it wants to stretch from Madison to Adams streets. "We think there is an opportunity to ... take the next year or so as Beta test is up to raise the necessary funds to get this off the ground," said Unger, who has taken up the cause with local filmmaker Jack Newell. The duo has received approval from the Chicago Transit Authority, the Chicago Department of Transportation, and Ald. Brendan Reilly (42nd), who together are looking at ways to transform Wabash — often an afterthought to pedestrians walking between Michigan Avenue and State Street — into a Downtown destination. Unger hopes the pilot lights will give the project enough visibility to raise the rest of its funding from private sources. A new L station is set to open at Washington and Wabash next year. “With all of the changes coming to the Loop Elevated tracks in this area, I believe Wabash Lights is a great opportunity for Chicago to further improve the Loop experience," Reilly said in a statement. The successful Kickstarter campaign was first reported Monday by Curbed Chicago.